The Virtual Community Reception Center (vCRC) is a web-based training tool that provides an overview of the CRC process for planners, managers, and potential CRC staff. CRCs are locations where public health agencies, and their partners, can perform population monitoring following a radiological or nuclear incident. 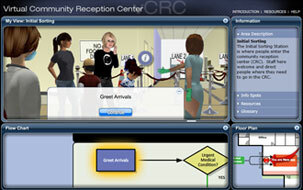 The vCRC was developed by the Centers for Disease Control and Prevention (CDC) and Oak Ridge Institute for Science and Education (ORISE) to provide users with an orientation to CRC operations. To register for continuing education credit for vCRC, click here. To request a copy of vCRC on CD-ROM, click here. Click here to return to the CDC vCRC page. Launch vCRC for the most current version or download the updated resources.